Three dynamic plays, including A Midsummer Night's Dream and Julius Caesar, will be featured at this summer's Shakespeare Santa Cruz festival on the UCSC campus. We welcome your comments about this issue and ideas for future ones. Send us email. In this issue: Celebrating UCSC grads...new academic leaders for Arts and Engineering...men's tennis snags another NCAA title...Shakespeare Santa Cruz prepares to return to the summer stage...and more. In daily installments leading up to our year-end commencement ceremonies, we're profiling 30 extraordinary students who will march in June. In their own words, the students reflect on the experiences that shaped their years on campus...and prepared them for life after UCSC. Catch up with our 30 GRADS! 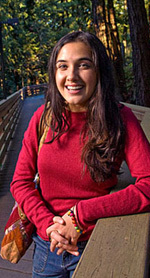 Third grader's higher ed experience: Third-grader Claire Dworsky's winning entry in a science competition has earned her the chance to investigate questions about water quality in marine scientist Adina Paytan's UCSC lab. Dynamic duo: UCSC has welcomed two new deans in recent weeks: David Yager (left), an innovative visual artist (Division of the Arts), and Arthur Ramirez, a leader in materials science (Jack Baskin School of Engineering). Remembering James Houston: A UCSC alumnus pays tribute to acclaimed author James Houston, who taught writing at UCSC for more than two decades. Houston died this spring at age 75. Cover story spotlights UCSC research: The cover story of the May issue of Scientific American, What Makes Us Human?, focuses on research conducted in UCSC biomolecular engineer David Haussler's lab. The research described in the article received widespread media coverage at the time it was published in 2006. This email was sent to pstults@ucsc.edu by ucscnews@ucsc.edu.